Excessive back pressure in the exhaust system can cause delayed turbocharger response. Eliminating restrictions in the exhaust system is key to increasing engine efficiency and power. The cp-e™ 5” cast stainless downpipe has been designed specifically for the N55 engines to minimize back pressure in the collector and optimize exhaust flow. The CAD designed castings on both ends of the downpipe are designed to work with a 5” diameter center section. This will be available with and with out a catalyst. The entire system (castings and tube) is made from 304 stainless steel. We used our FARO CMM (Faro Technologies Coordinate Measuring Machine) to design the downpipe. With our CMM we were able to digitize the model and keep within .010” of the stock flanges and mounting points. In addition to the downpipe being designed in CAD, our fixtures for the manufacturing of the downpipe were also designed in CAD. The fixtures were then laser cut and CNC machined to assure precise fitment, every time. This extensive process is nearly impossible to replicate with a hand fabricated part. 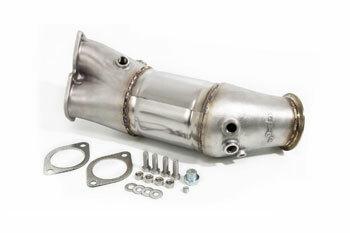 The 5″ downpipe may be installed without any permanent modifications, and is available with or without a cp-e™ custom designed high-flow catalytic converter. While this may not trip a Check Engine Light, we cannot guarantee that all of the codes will be in the “ready” state.